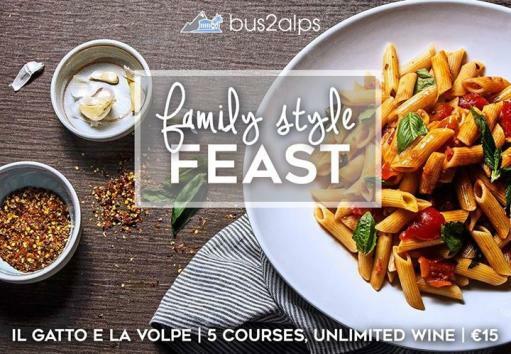 Italians value family dinners every week, which is why every Wednesday, Bus2alps partners with Il Gatto e la Volpe to give you a taste of an authentic family-style dinner. Whether it's your first time joining us or you're a Wednesday regular, anyone's welcome to join us to indulge in various antipasti, four different types of pasta, unlimited wine, water, and bread...all for just €15. *Have dietary restrictions? Gatto can accommodate for vegetarian and gluten-free options!